The beer brand wants Americans to know the facts about its use of corn syrup. MillerCoors has taken out a full-page ad in The New York Times to respond to Bud Light’s Super Bowl commercials, which attacked MillerCoors for brewing its beer with corn syrup. In the HBO "Game of Thrones"-Bud Light spots, which were created by Droga5 and Wieden & Kennedy, the Bud Knight sees barrels of corn syrup being delivered to MillerCoors’ Miller Lite and Coors Lite medieval kingdoms. The MillerCoors brands quickly responded on Twitter during the big game, sarcastically thanking Bud Light for including them in the spot. On Tuesday, MillerCoors went a step further to defend itself in a print ad letter penned to "Beer Drinkers of America." 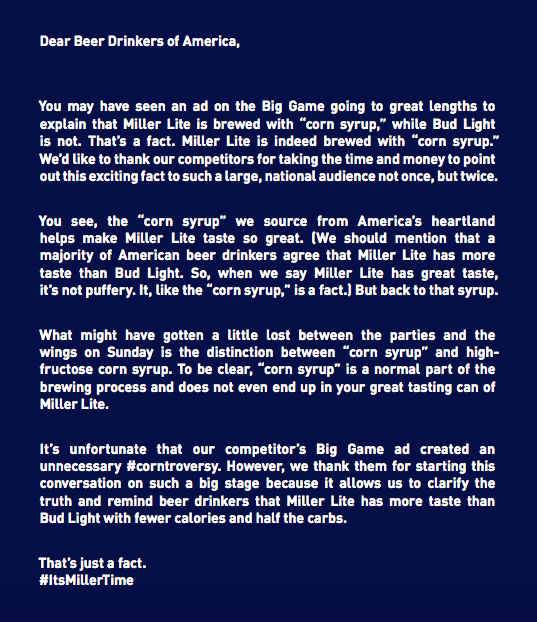 "You may have seen an ad on the big game going to great lengths to explain that Miller Lite is brewed with ‘corn syrup,’ while Bud Light is not. That’s a fact. 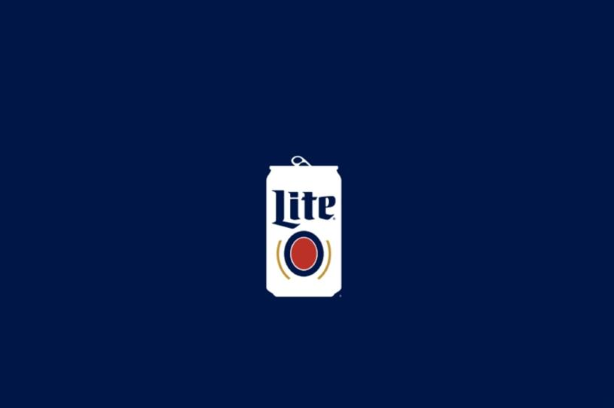 Miller Lite is indeed brewed with ‘corn syrup.’ We’d like to thank our competitors for taking the time and money to point out this exciting fact to such a large, national audience not once, but twice," the ad reads. It goes on to explain its use of corn syrup, as well as to "remind beer drinkers that Miller Lite has more taste than Bud Light with fewer calories and half the carbs." See the full print ad below.